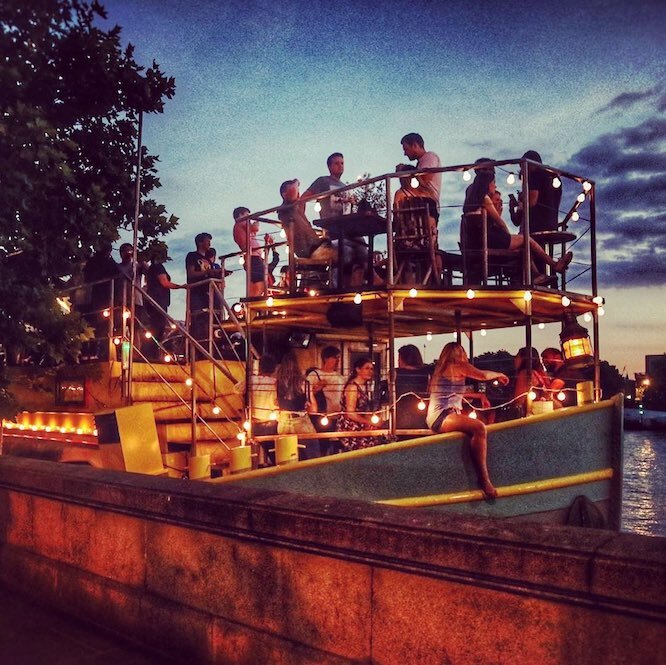 These beautiful pubs on the Thames are perfect for riverside pints. 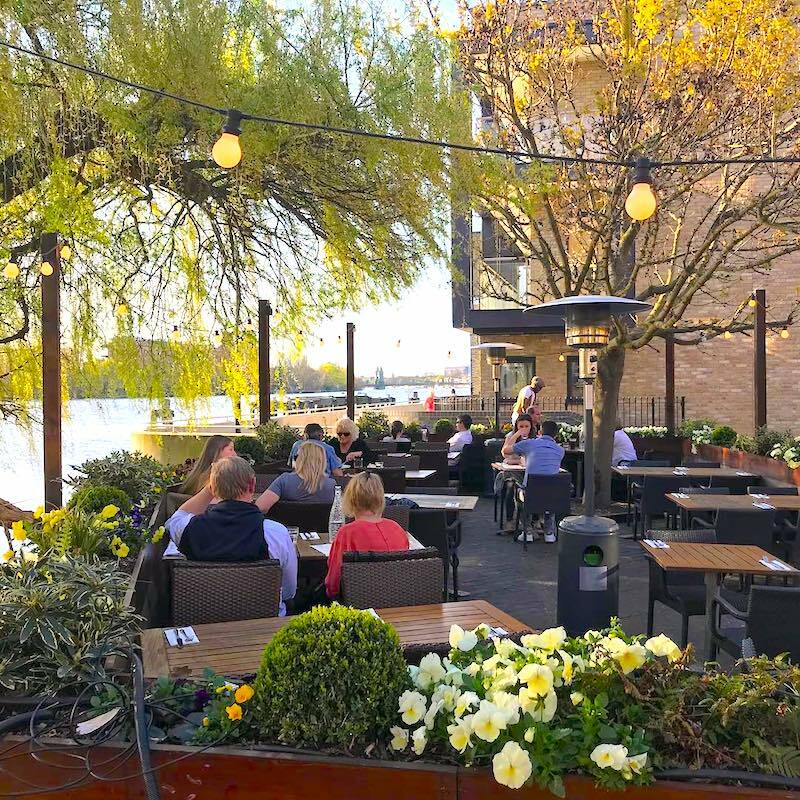 When the sun is shining, Londoners flock to these Thames-side pubs and restaurants for outdoor drinking and dining. 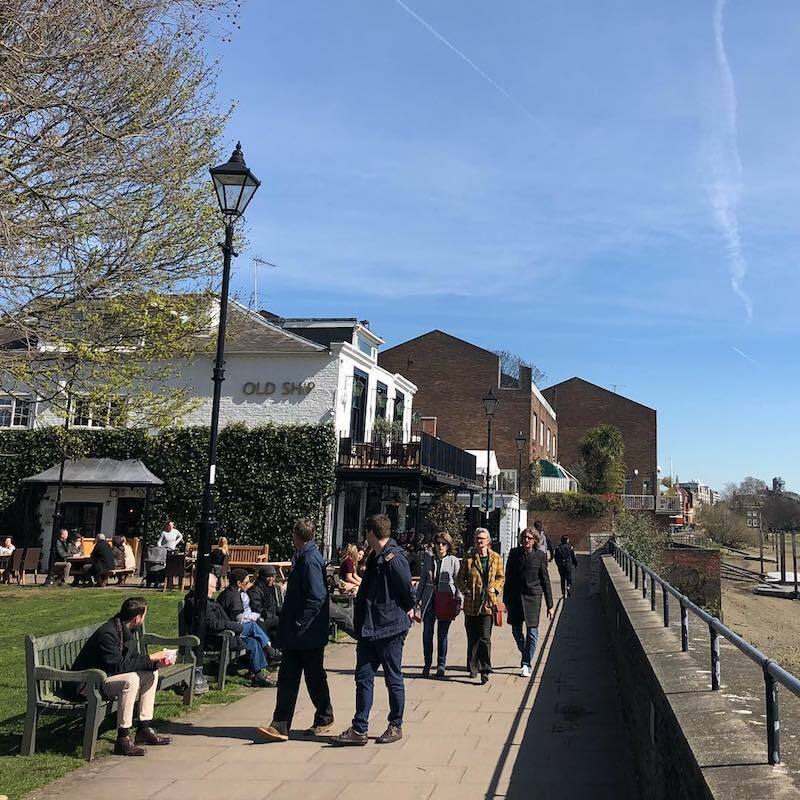 And although east and north London offer their own pretty canalside pubs, our city has always been built around the riverside, making some of the below among the oldest pubs in London… and positively salty with maritime history. We’ve liested the pubs from east to west, to make it easier to navigate. In real life, it’s easy to wander from one to the other – just follow the big blue river! For each locaation, a (N)orth or (S)outh is noted, to indicate which riverbank the pub can be found on. 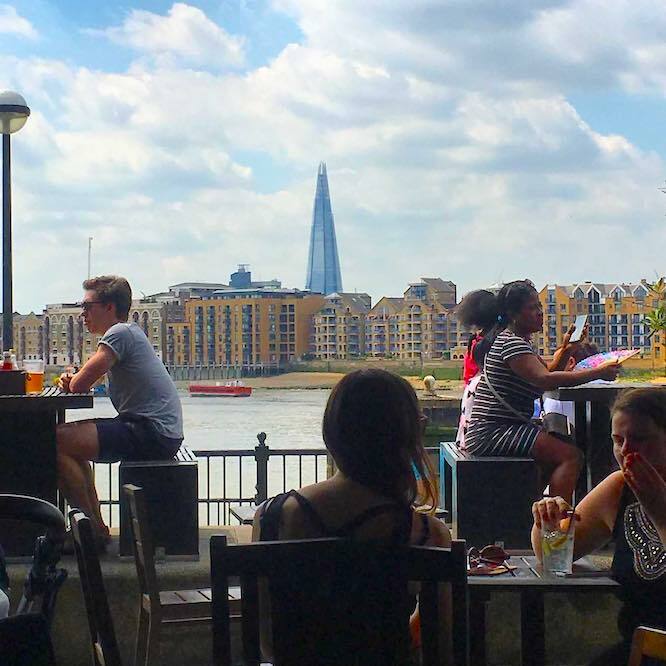 This Fullers pub by the river delivers views of the O2 across the Thames. Re-opens after a refurb on May 13. 27 Coldharbour, E14 9NS. 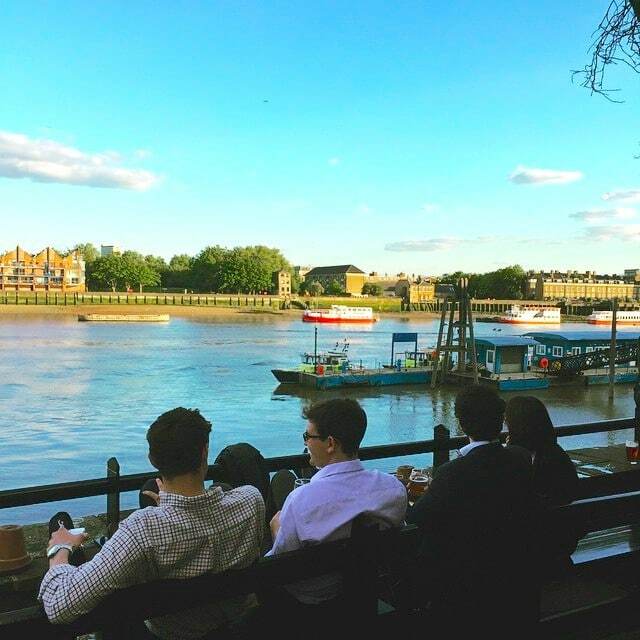 On a sunny day, head to the waterside picnic tables at this classic Youngs pub in Greenwich. 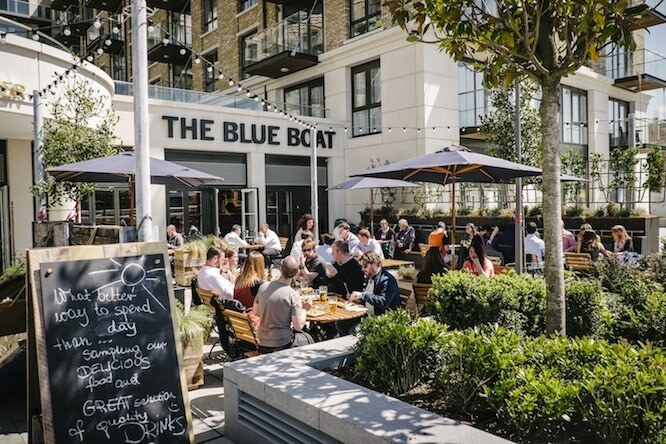 4-6 Ballast Quay, SE10 9PD. 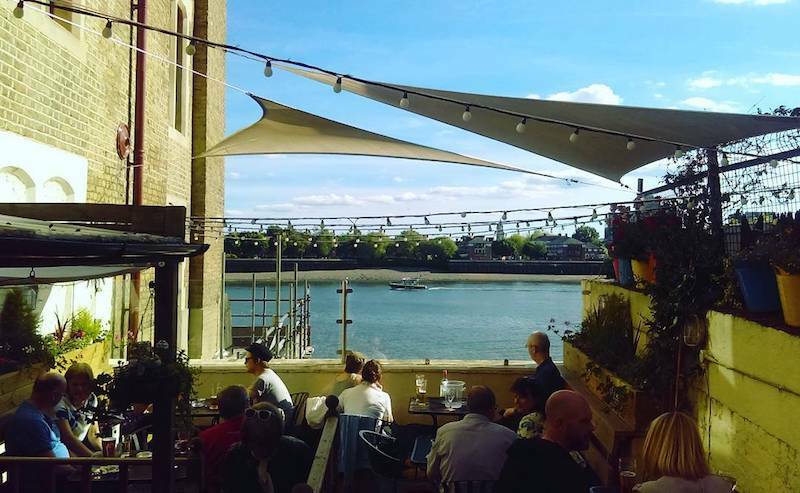 Grab a window seat at the beautiful Trafalgar Tavern for sweeping riverside views; it’s also a popular wedding venue due to its fetching interior. Park Row, SE10 9NW. 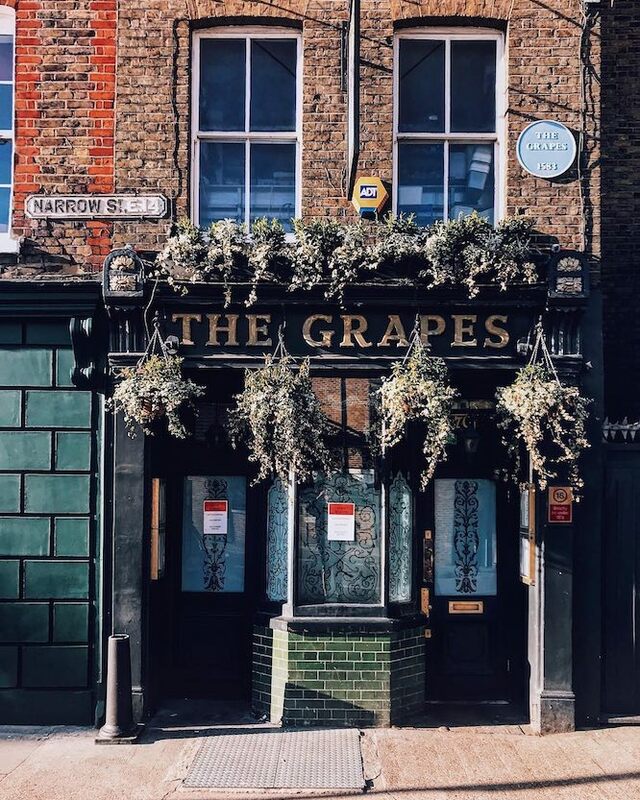 This classic east London pub is owned by Magneto himself, Sir Ian McKellen. There’s also a cool statue semi-submerged in the river that looks like it’s walking on water. The pub quiz is good too! 76 Narrow Street, E14 8BP. 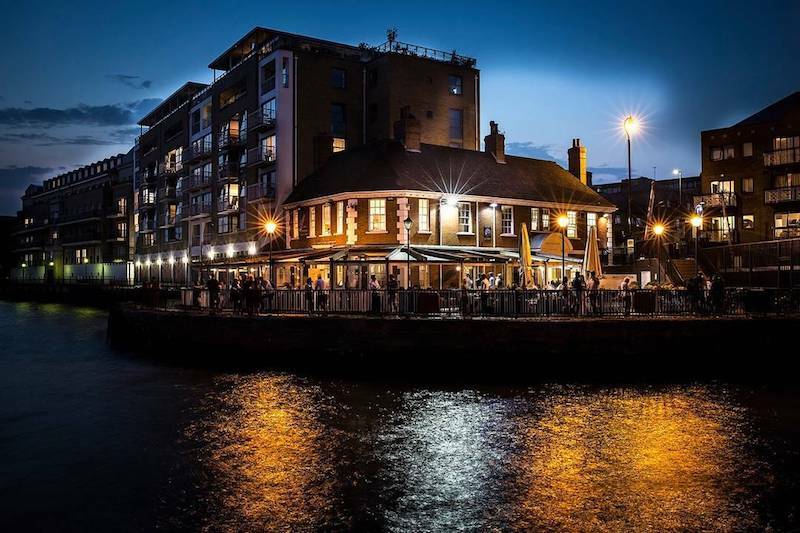 This Gordon Ramsay gastropub on the corner of Limehouse Marina does some decent grub, as you might expect. 44 Narrow Street, E14 8DP. A respectable Greene King pub on the Thames in the historic neighbourhood of Rotherhithe, with views across to Wapping. 163 Rotherhithe Street, SE16 5QU. 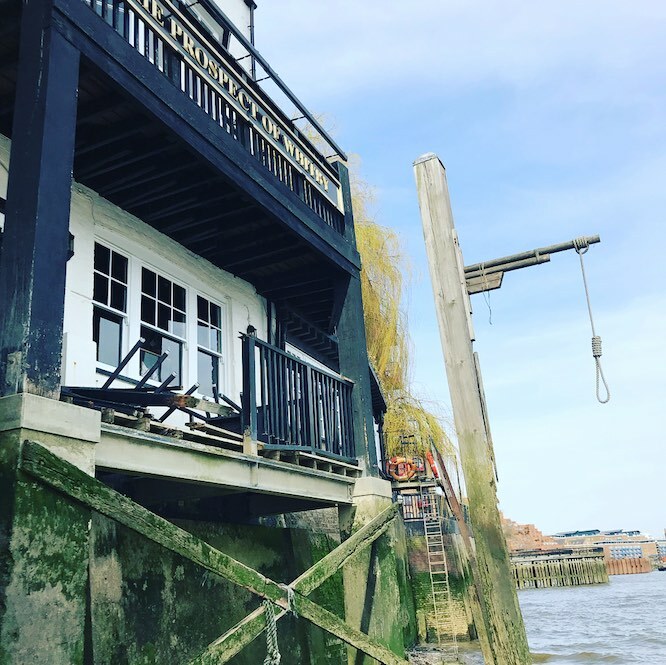 This historic, nautical pub still has a noose installed from when pirates were executed here. Full of character, it’s an altogether unique place for a weekend, uh, hang. 57 Wapping Wall, E1W 3SH. If you’ve ever fallen asleep on the bus after a session at the pub and woken up in Penge, spare a thought for the Mayflower Pilgrims who set off from here one night and ended up settling in America. 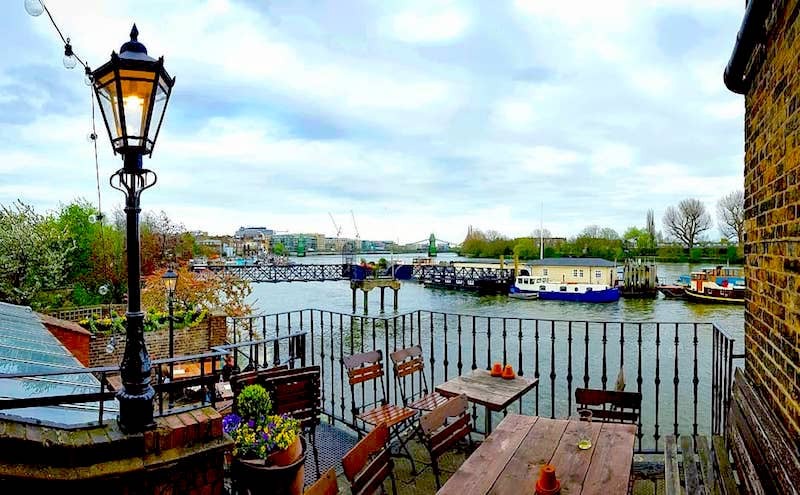 It remains a truly beautiful boozer with a riverside terrace; although at the highest tides water splashes up dramatically through the rickety floorboards! 117 Rotherhithe Street, SE16 4NF. 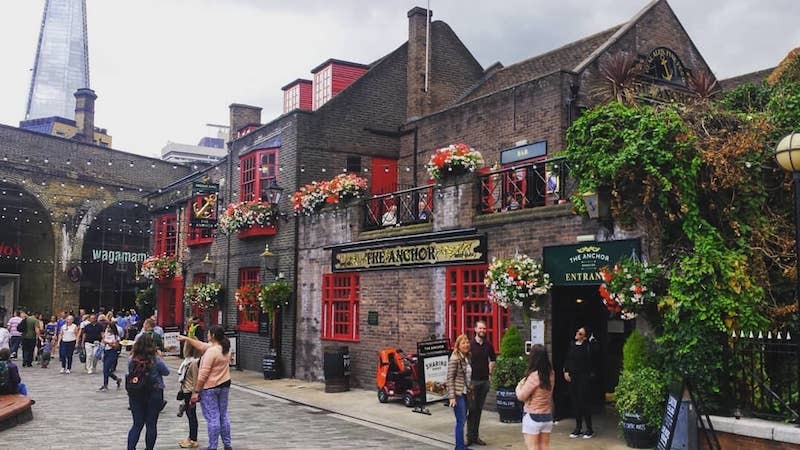 Sam Smiths’ riverside pub The Captain Kidd has an interior inspired by piratical history – let’s put to one side the fact it only dates back to the 1980s. 108 Wapping High Street, E1W 2NE. Nearly 500 years old, the Town of Ramsgate is one of the oldest pubs in London. As the site mentions: ‘If you visit during low tide, you can still see the post to which condemned pirates were chained to drown as the tide rose.’ Fun! 62 Wapping High St, E1W 2PN. 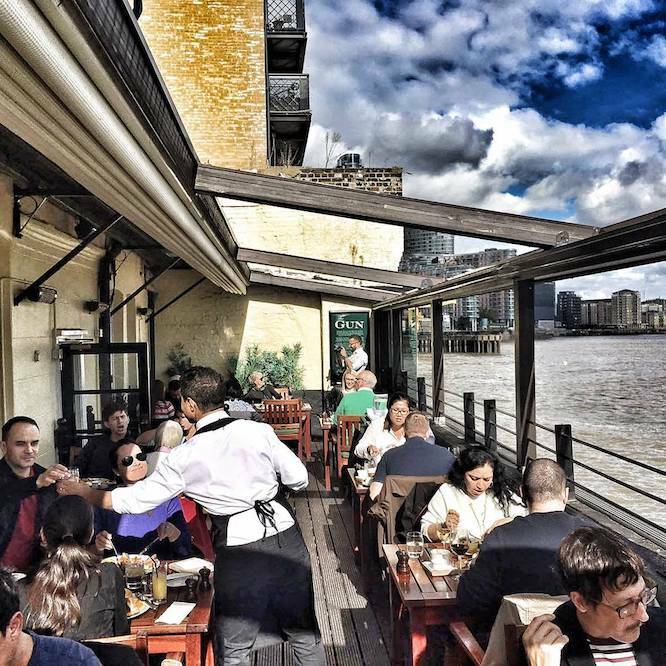 This restaurant on the Thames offers upscale French food, including brunch, on a riverside terrace. In the winter, cosy furry blankets add seasonal comfort. 36D Shad Thames, SE1 2YE. 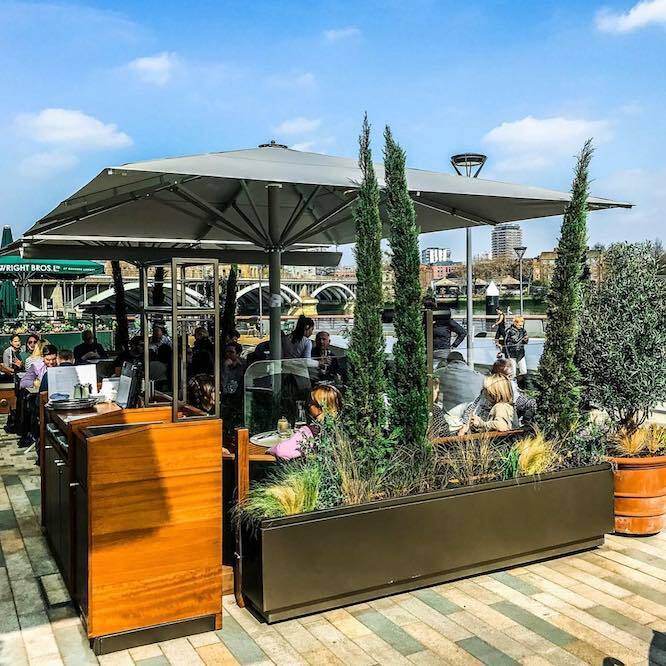 Right next door, an Italian riverside restaurant will serve you some chilled prosecco and cheese-wheel pasta to enjoy al fresco. 36C Shad Thames, SE1 2YE. 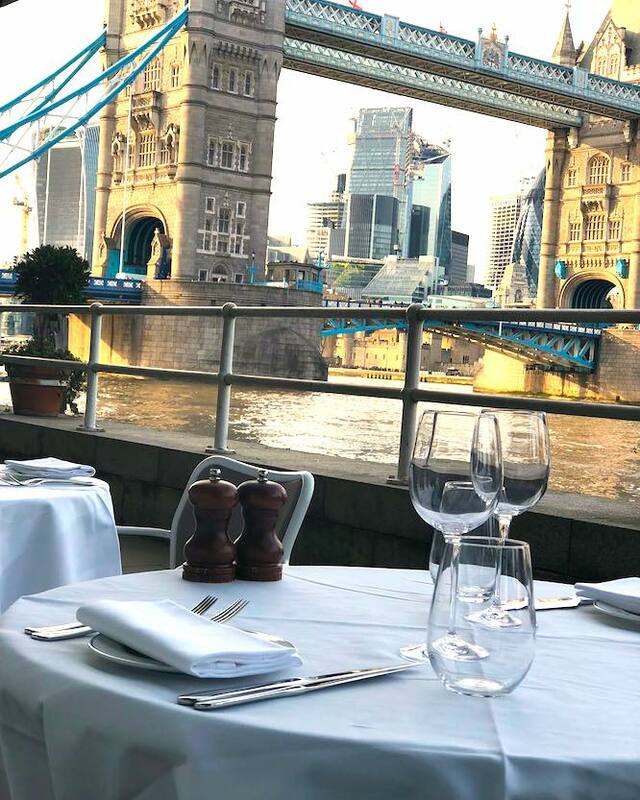 Even closer to Tower Bridge, this chophouse (owned by the same outfit as the previous two) will do you a sizzling steak or Sunday roast, among other classically meaty British dishes. 36E Shad Thames, SE1 2YE. 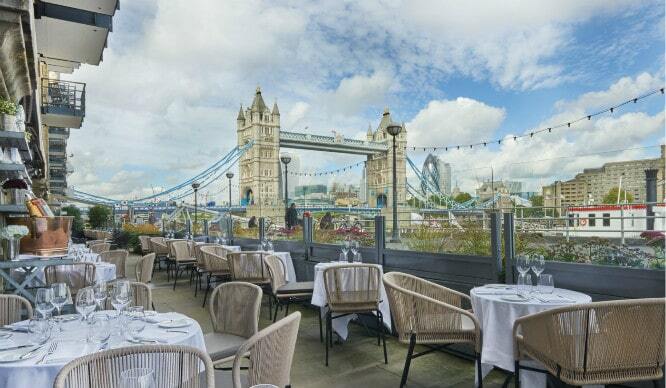 A reasonably-priced restaurant next door to the famous Tower of London, Coppa Club is extremely well-known for its wintertime riverside igloos and summery ‘Mediterranean’ pergolas. 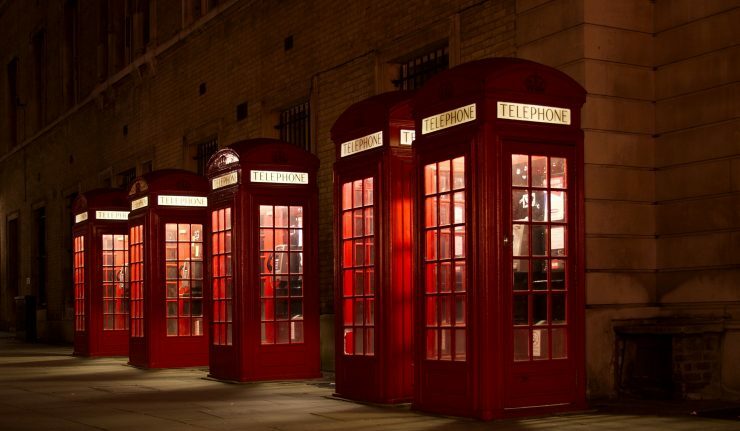 3, Three Quays Walk, Lower Thames St, EC3R 6AH. 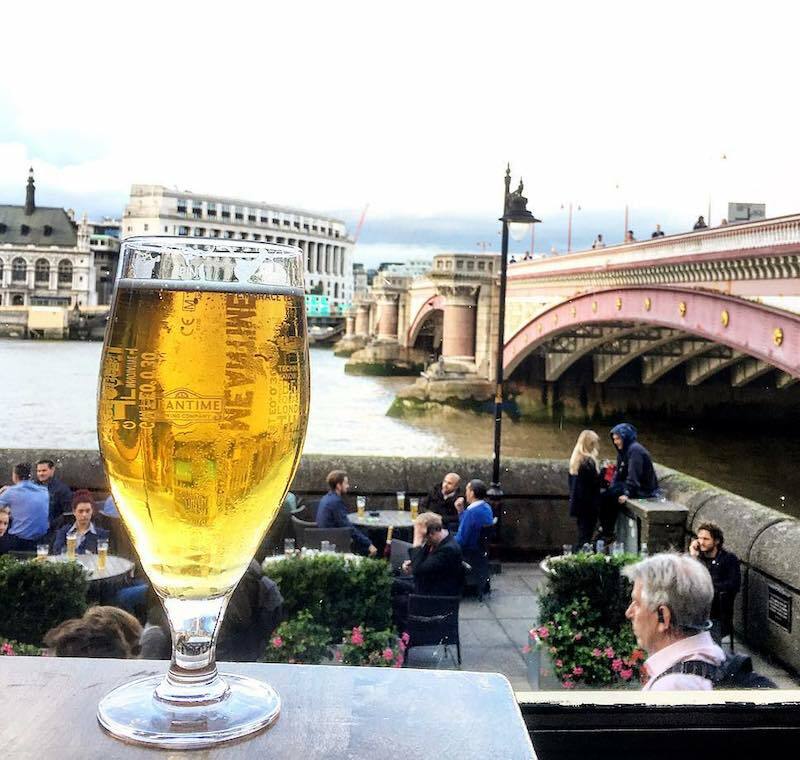 A simple but sophisticated English pub off Hay’s Galleria in London Bridge, with chandeliers inside and a precious few riverside tables outside – albeit with a lot of foot traffic zooming past. 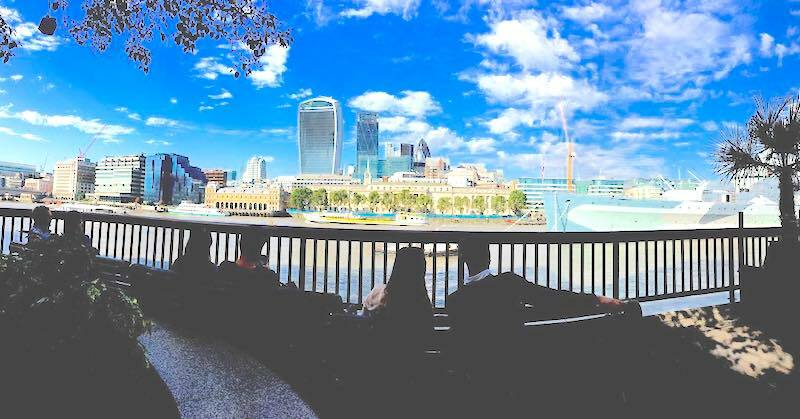 26 Hays Galleria, SE1 2HD. The ‘local’ for the Shakespeare’s Globe theatre, this pretty pub on the Thames has a roof terrace that’s much in demand from tourists and locals. 4 Park Street, Southwark, SE1 9EF. 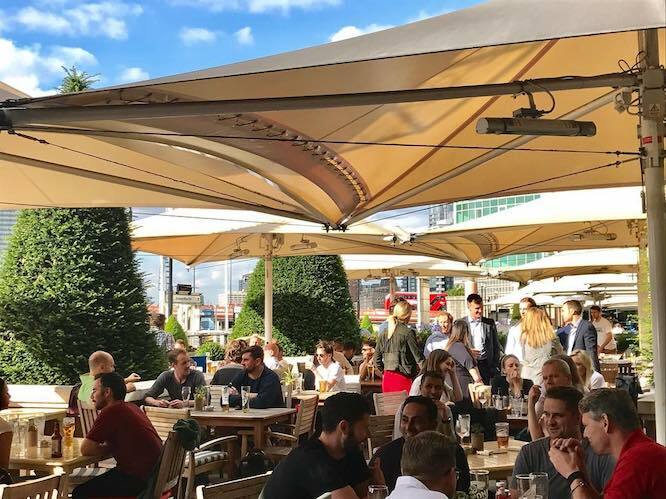 Probably the riverside pub you’ve wandered past most often, this boozer by Blackfriars Bridge is an aesthetic catastrophe – but if you’re sitting on the roof terrace, you’ll be looking the other way! They also sponsor their own annual boat race, which is nice. 1 Blackfriars Bridge, SE1 9UD. 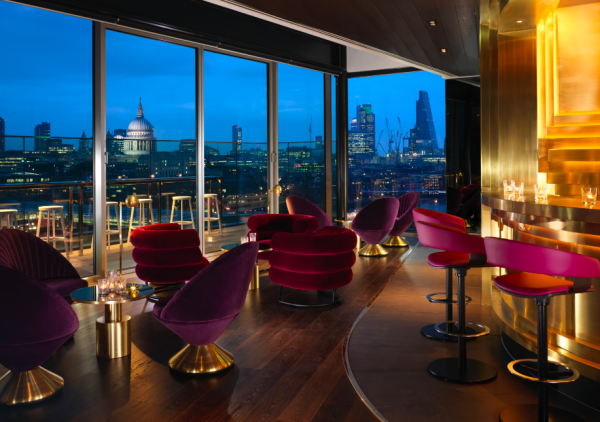 Both situated in the achingly-hip Mondrian Hotel, the Sea Containers restaurant on the ground floor offers some outdoor tables by the Thames, while the gorgeously ‘grammable Rumpus Room on the top floor provides panoramic views and rooftop terrace. 20 Upper Ground, SE1 9PD. 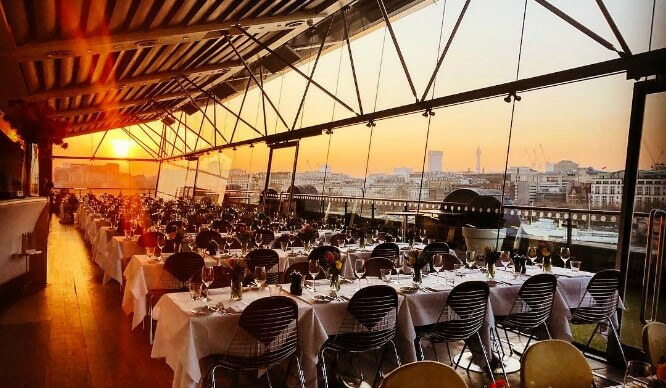 Split into a restaurant, bar and brasserie, book a table by the floor-to-ceiling windows for wonderful views over central London. In fine weather, there are some outdoor tables available too. 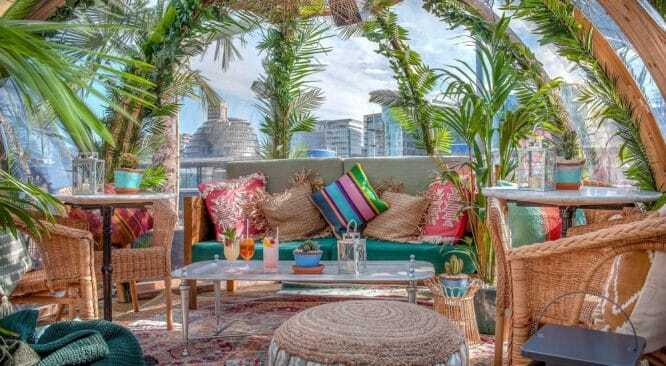 8th floor, OXO Tower Wharf, Bargehouse Street, SE1 9PH. 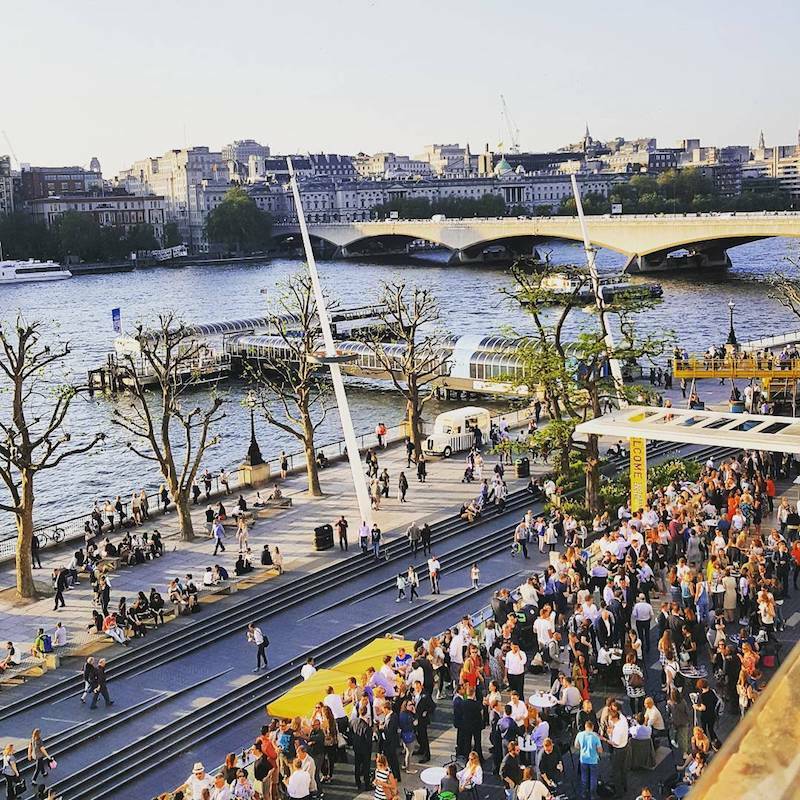 The epicentre of the brutalist Southbank arts centre, head to the sixth floor of the Royal Festival Hall for a tipple at their bar, which can be enjoyed on their outdoor terrace. There’s also a street-level outdoor seating by the café, or an excellent weekend street food market out back. 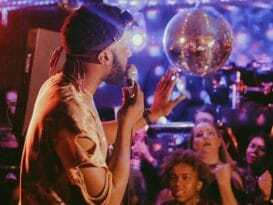 This banging barge is truly the Boat That Rocked; it now plays host to all manner of concerts and comedy shows below decks, while offering open-air thrills above. Albert Embankment, SE1 7TP. 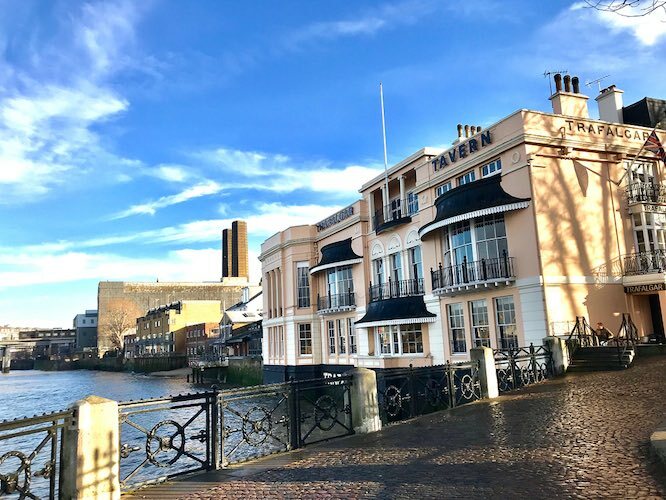 We’re moving away from medieval taverns with shanty-singing history and deeper into Luxury Flats territory: this modern pub on the Thames prides itself on its gin. 5 St George’s Wharf, SW8 2LE. 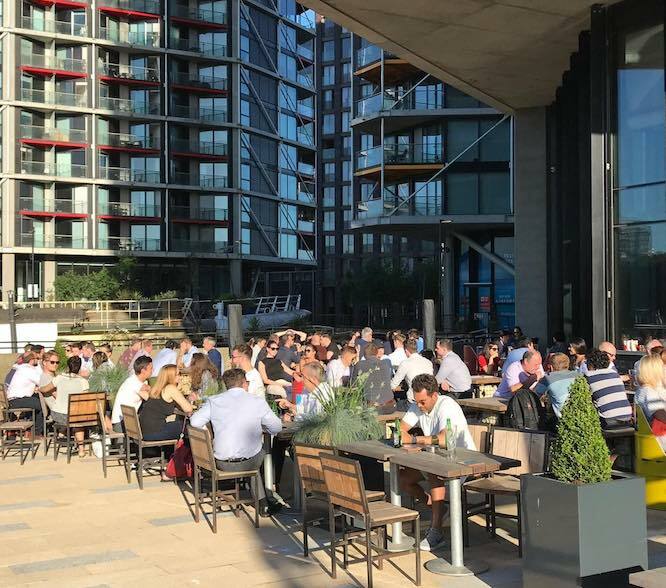 A cluster of tables beneath towering glass-and-steel redevelopments offers locals a sunny spot for a bottle of wine on a warm spring day. Riverlight Quay, Nine Elms Lane, SW8 5BP. 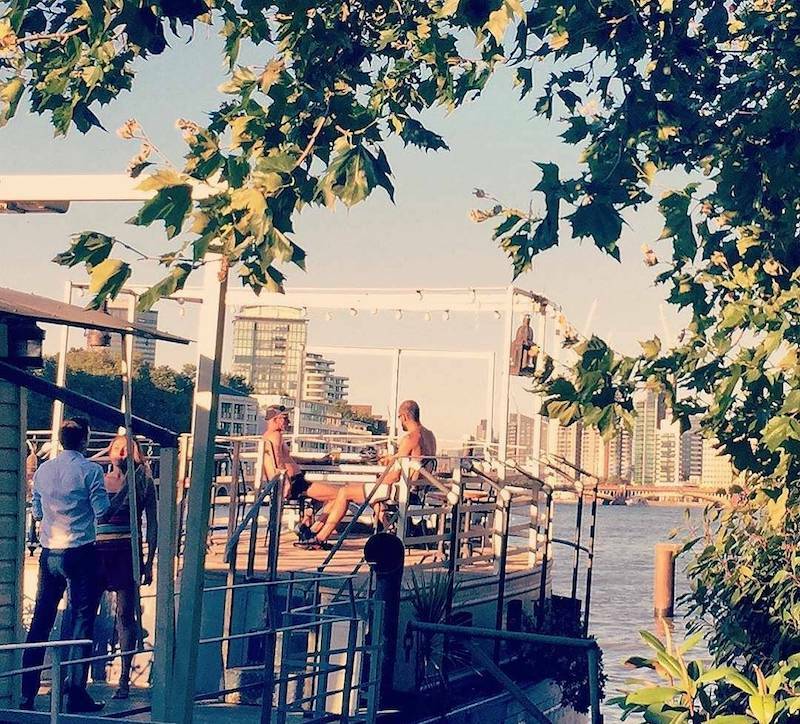 A sister vessel to the Tamesis Dock, the Battersea Barge is another charming floating bar, which can also be hired out for a riverside London wedding. Nine Elms Lane, SW8 5BP. 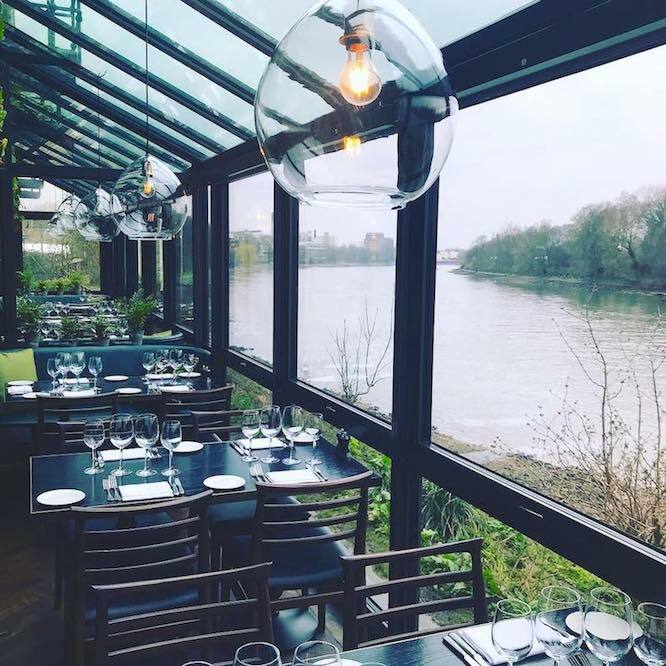 A modern restaurant in the Battersea Power Station redevelopment, there’s all-day dining to be enjoyed on the banks of the Thames here. 29 Circus West Village, Battersea Power Station, SW8 4NN. Another riverside restaurant from the D&D team, who run all those places by Tower Bridge as well. 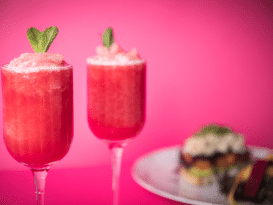 They offer a brunch preceded by a spinning exercise class if you have a psychological need to ‘earn’ your mimosa. Sopwith Way, Circus West Village, Battersea Power Station SW8 5BN. 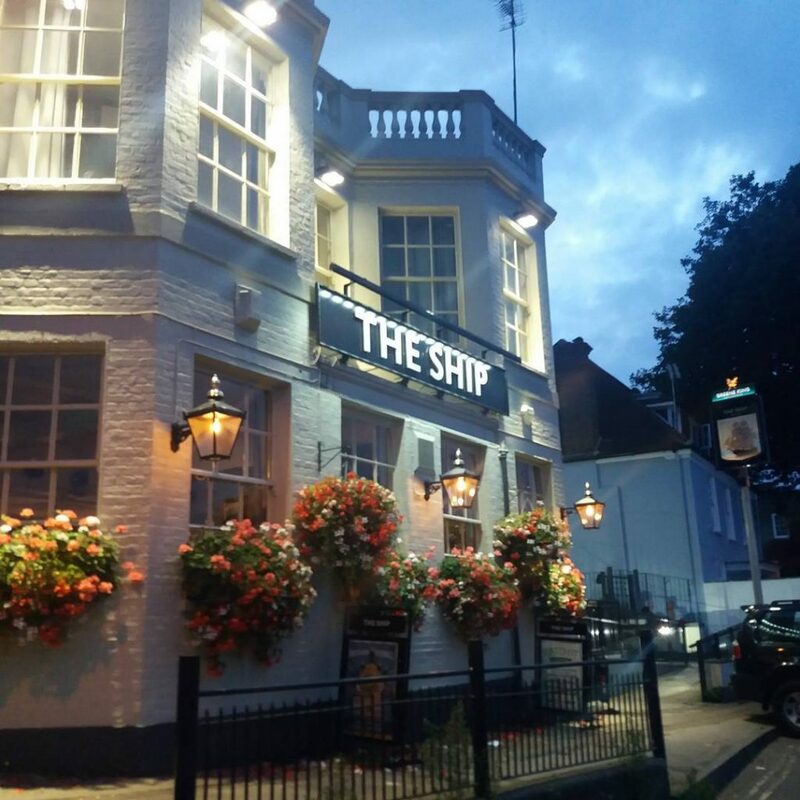 A firm favourite of south-west Londoners, The Ship has been running for over 200 years. 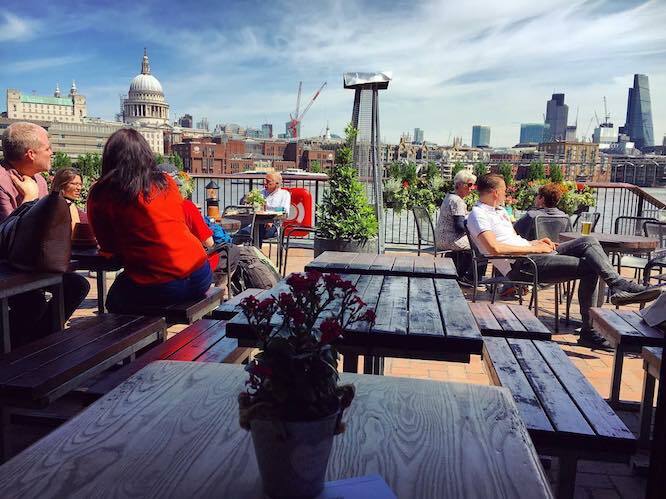 There’s modern British cooking from the kitchen and a big old terrace for warm weather days, plus it’s open until midnight on the weekends. 41 Jews Row, SW18 8TB. 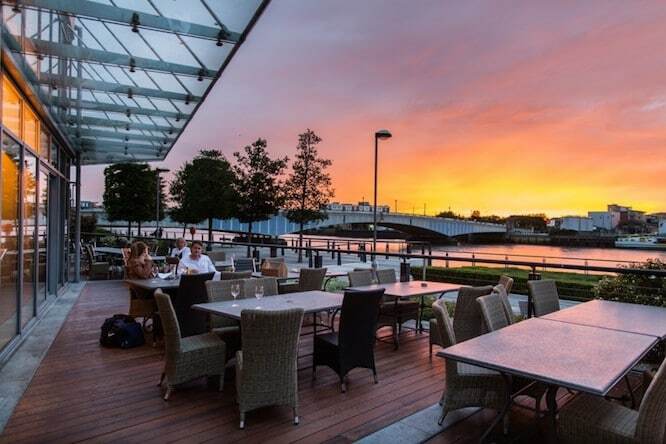 Set slightly back from the water’s edge, The Boathouse does offer a first-floor terrace as well as out-front seating. Brewhouse Lane, SW15 2JX. 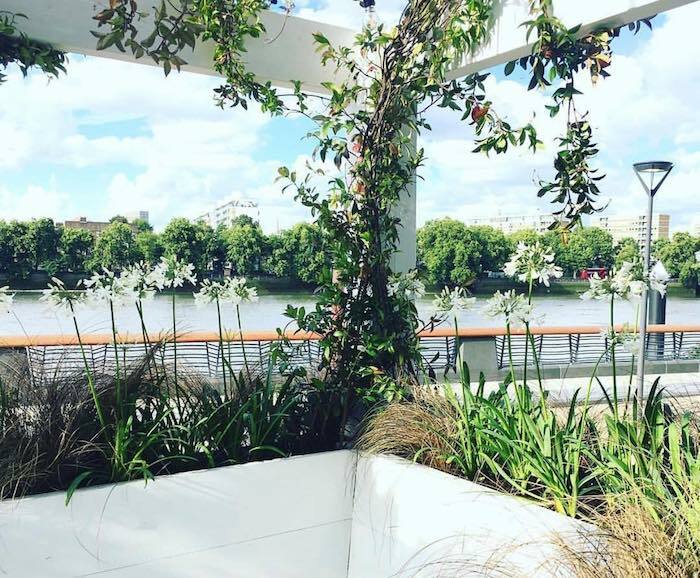 You can grab a Pad Thai by Papa Thames at this riverside restaurant – just make sure to book a window seat! 2-4 Lower Richmond Road, SW15 1JN. 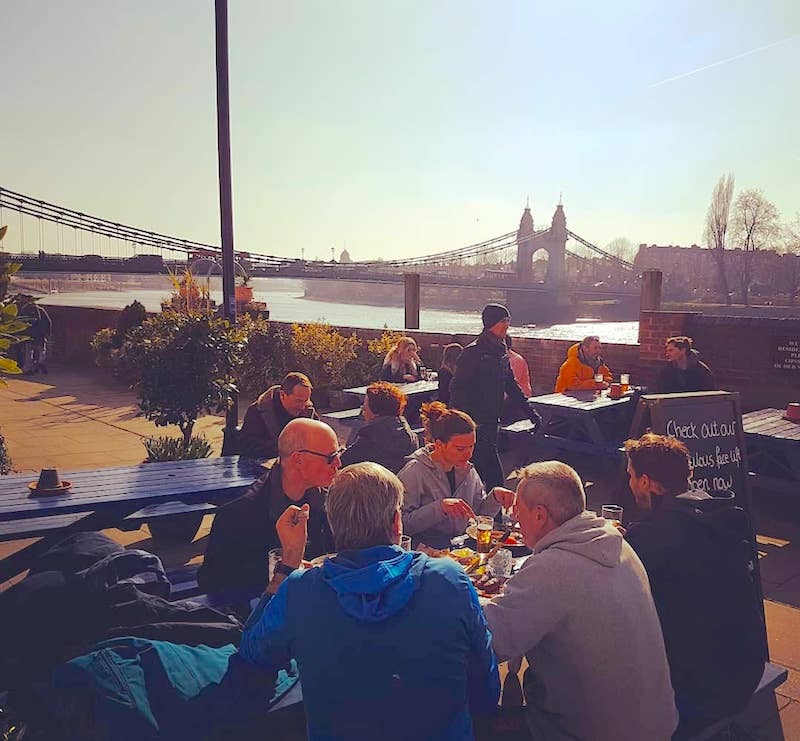 A great pub close to Fulham FC, the Crabtree’s riverside terrace has its own BBQ grill which operates during the months. Rainville Road, Fulham, W6 9HA. 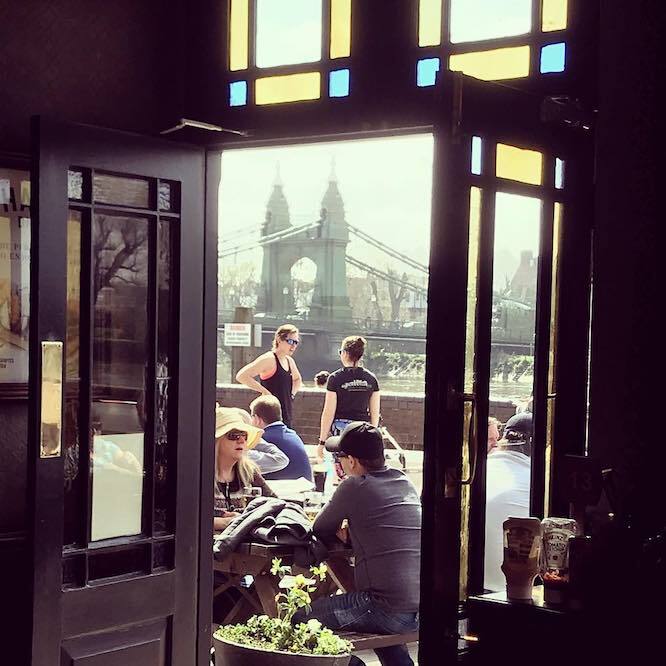 A standard Fuller’s pub with a patio by the Thames. 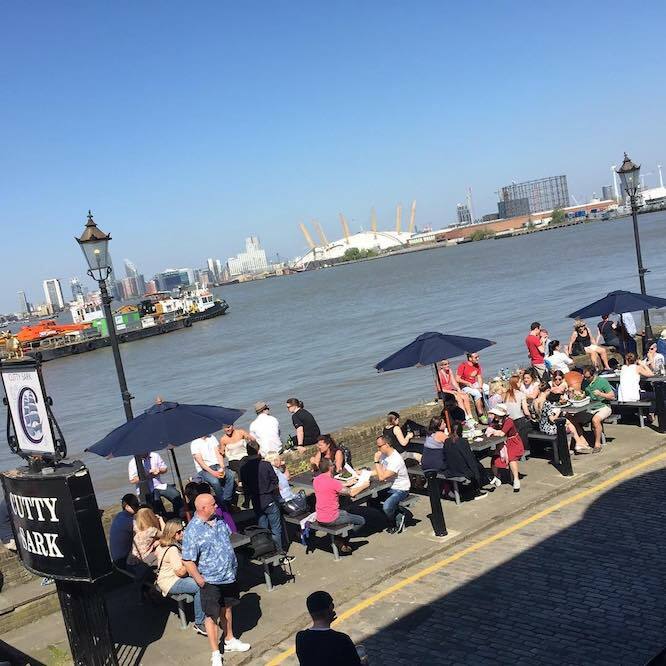 Distillery Wharf, Parr’s Way, London, W6 9GD. Yet another Greene King pub on the river, the Rutland Arms is just a couple of doors down from the Anchor. 13 Lower Mall, Hammersmith, W6 9DJ. Another riverside pub with centuries of history behind it, The Dove claims this was where ‘Rule Britannia’ was composed. 19 Upper Mall, W6 9TA. 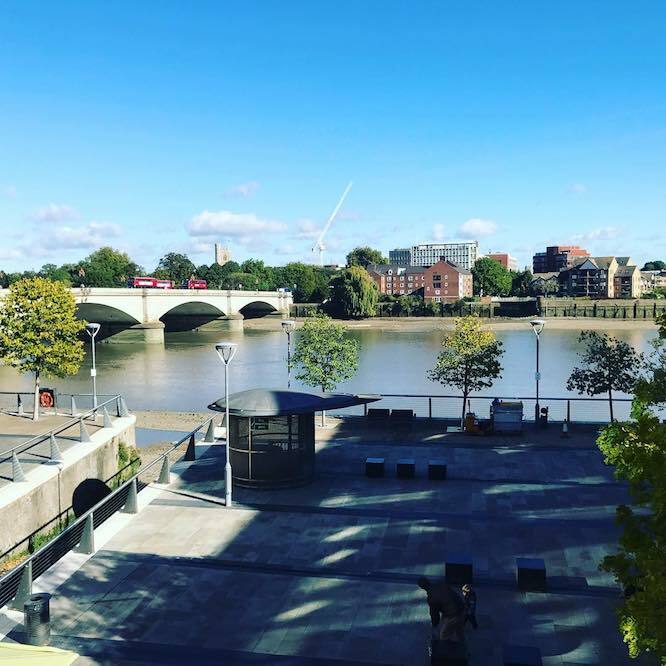 Hammersmith really does have an embarrassment of riches in the riverside drinking stakes. 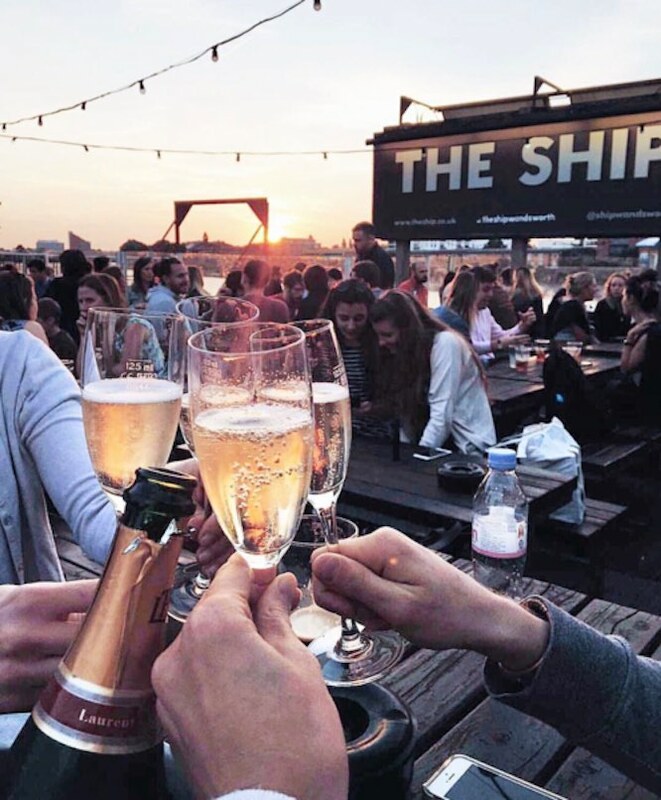 The Old Ship has enjoyed a recent refurb and also rocks a decently-sized beer garden. 25 Upper Mall, W6 9TD. 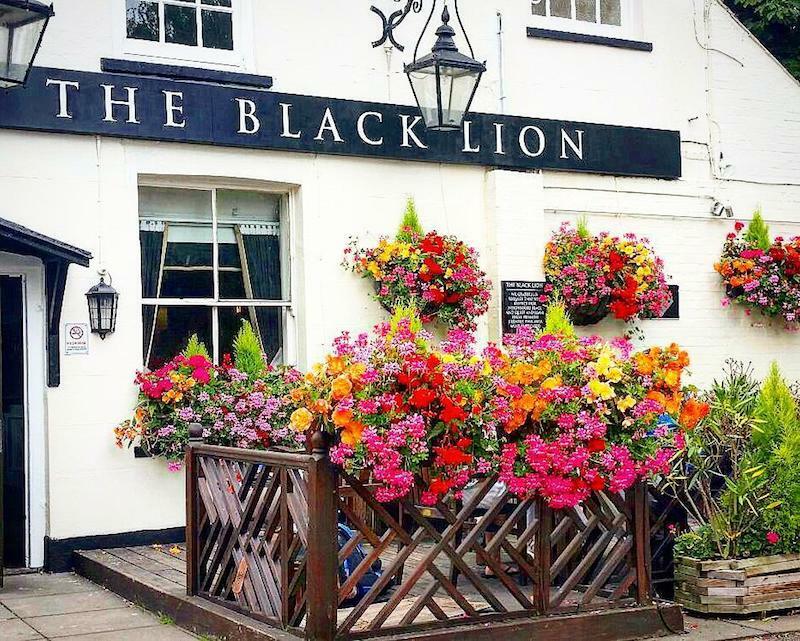 The Black Lion presents an gin collection from the nearby Sipsmith distillery and ‘pub grub, only better’ – we’ll have to check it out and get back to you on that. 2 South Black Lion Lane, W6 9TJ. 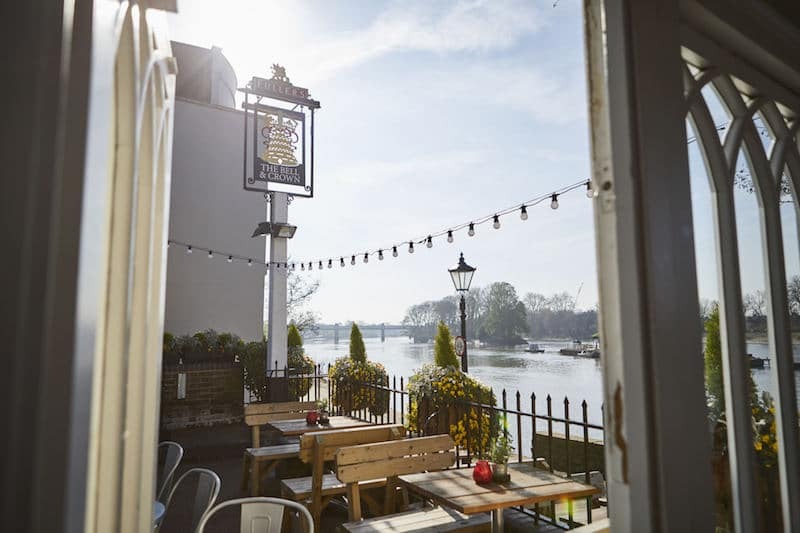 Enjoy a sunset over the Thames from the terrace at the White Hart pub; or take in the view from their fancy dining room upstairs. 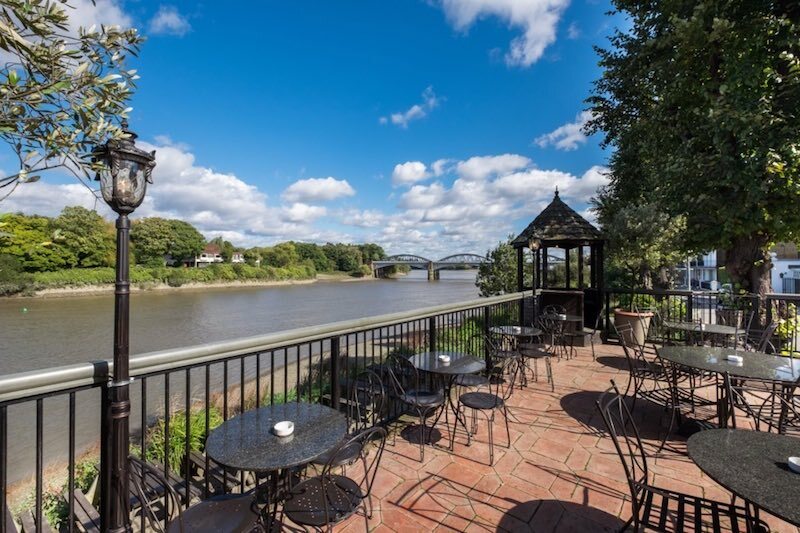 The Terrace, Riverside, Barnes, SW13 0NR. Celeb chef and noted fish-wrangler Rick Stein has a well-reviewed seafood restaurant here in the pretty little neighbourhood of Barnes. ( Note you can’t specifically book a window seat in advance.) 125 Mortlake High Street, SW14 8SN. 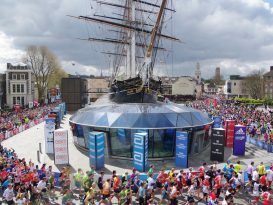 Timber floors, plenty of beer and a fabulous view of the Boat Race finishing line. 10 Thames Bank, SW14 7QR. 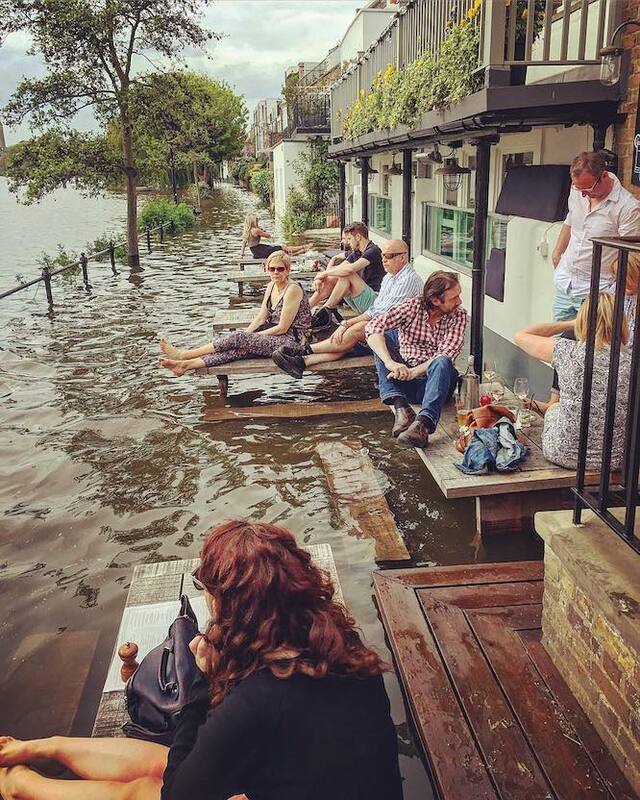 When the river rises during high tides and after heavy rains, the City Barge pub’s outdoor seating can get VERY close to the water indeed! 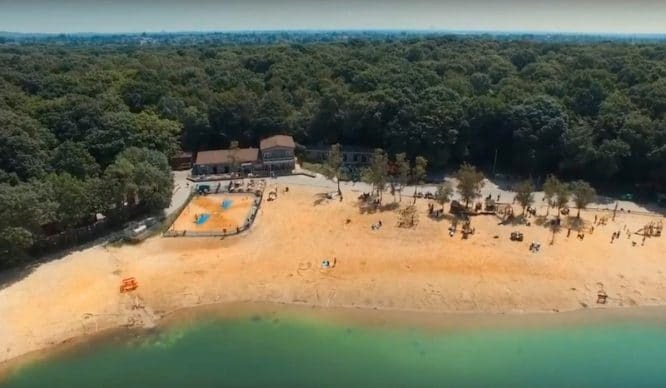 It also faces out onto a little island, which is neat. 27 Strand-on-the-Green, W4 3PH. 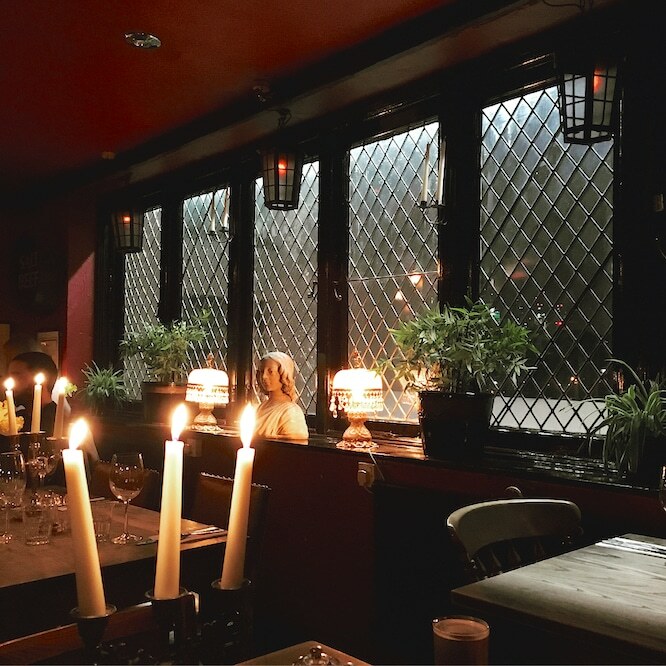 Perhaps your legs will carry yet further west to Richmond, Henley, or even Oxford, but we’ll leave our explorations here for now, at the Bell and Crown. 11-13 Thames Rd, Strand on the Green, W4 3PL.